Recent public dialogue in Canada on national pharmacare has focused primarily on the high prices of prescription drugs and the would-be savings of a universal, public and single-payer plan. 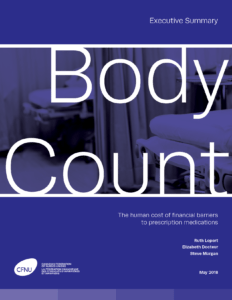 This groundbreaking new report explores the human cost of a lack of financial access to prescription medications. Researched and written by the distinguished pharmaco-economist, Dr. Ruth Lopert, along with colleagues Elizabeth Docteur and Dr. Steve Morgan, this report reveals, for the first time, the estimated body count, or yearly number of deaths and illnesses in Canada, for specific age cohorts and conditions, resulting from cost-related non-adherence (CRNA) to prescription medications. Although data scarcity makes it impossible to estimate total mortality for the entire population, the figures in Body Count nevertheless provide a meaningful catalyst for discussion. As Canada’s political conversation on pharmacare moves forward, Canada’s nurses believe it is essential that we bear in mind the human cost of inaction. With every day that passes, Canadian lives are lost or are devastated because of inadequate or non-existent drug coverage. It is time that we better understand the nature this preventable tragedy.